Last week, as I was sharing my basmati rice, cardamom, and pistachio porridge, I mentioned that my breakfasts have been a little formulaic lately. It’s necessity more than anything else: mornings are hurried, even on weekends, and the time to prepare something ornate is limited. 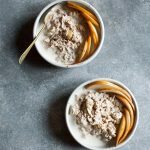 For the most part, I’ve been sticking to oats and chia puddings and other staples. But every now and then, it’s good to break out of one’s routine, and this quiche is a delicious, savory way to do it. No, this isn’t my simplest or quickest recipe. It involves some moving parts, some finesse. But in spite of the fact that simple food is nearly always the kind I like best, it’s nice to undertake a culinary project now and then. This is, believe it or not, my first vegan quiche. I’ve seen countless recipes through the years, but it always seemed like so much…work. In reality, it’s no more work than throwing together a casserole or a gratin or any other baked dish. If you plan well and make the crust a day in advance, it’s actually quite a simple recipe — and a very rewarding one. Speaking of crust, I’m really happy with this one. 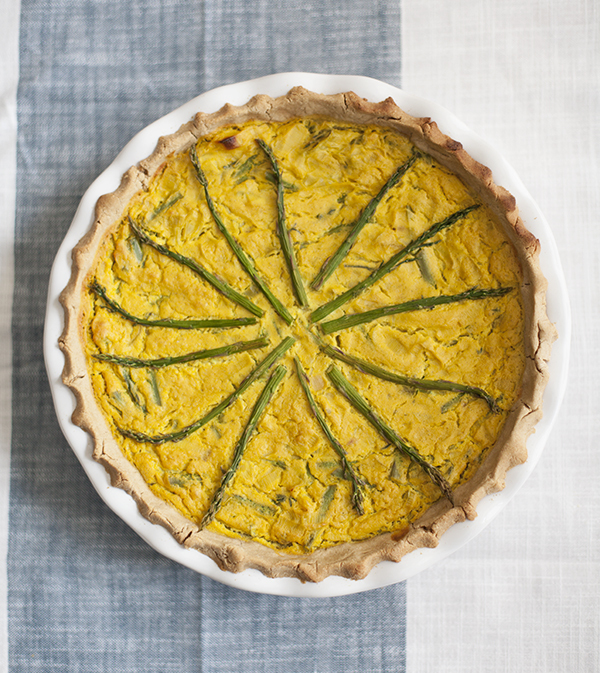 It’s a nontraditional choice for a quiche–not flakey or buttery, but rather quite sturdy. What it lacks in authenticity I think it makes up for with wholesome and pleasantly nutty flavor. And it gets bonus points for ease: after you whip it up in a food processor, you can press it into a pan and be on your way. 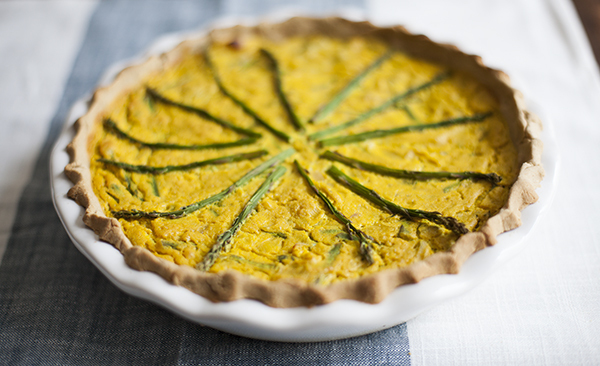 There are different ways to handle vegan quiche. I’ve seen recipes using silken tofu, and others using extra firm. I opted to use silken, but I added chickpea flour and nutritional yeast to firm it all up. I also used a small potato, for which you can definitely substitute mashed navy or cannellini beans. There’s a science to all baking, but this recipe is at least a little adaptable. And I think the texture turned out really nicely. Before I get to the recipe itself, I have to mention how delightful the leek and asparagus combination is in this recipe. I cooked the leeks for a good long time, till they were browning slightly and getting sweet. 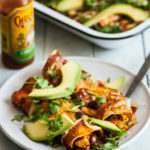 It added a lot of dimension to the recipe, and I suggest you do the same! To make the crust, place the flours and salt into a food processor fitted with the S blade. While pulsing continuously, drizzle in the olive oil and then the water. As soon as the crust is holding together in the processor -- not forming a ball, but getting a little sticky -- stop adding water. 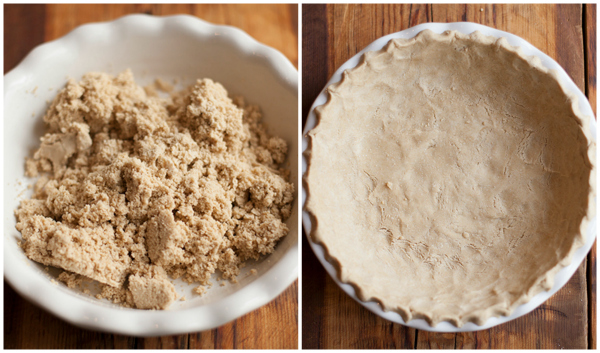 Empty the dough into an oiled pie dish and use your fingers to press it around evenly. It should cover the bottom and the sides of the dish easily. Flute the edges of the crust. 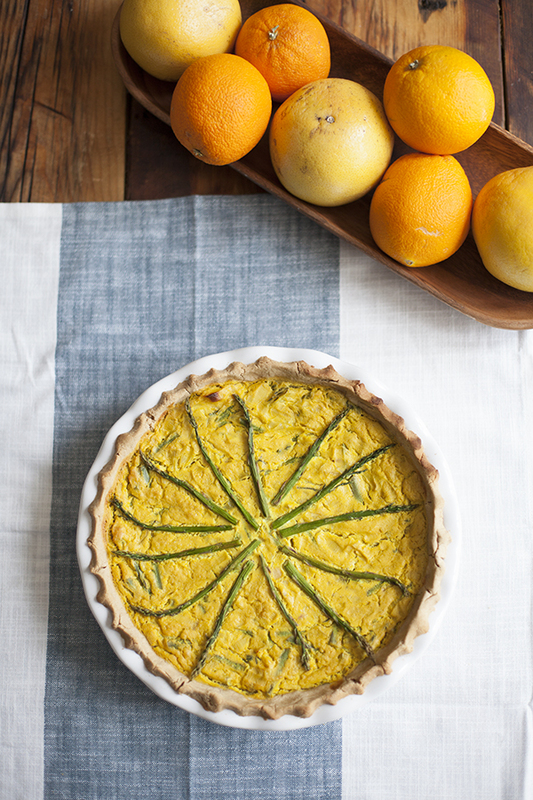 Place the crust in the fridge until you're ready to assemble the quiche. 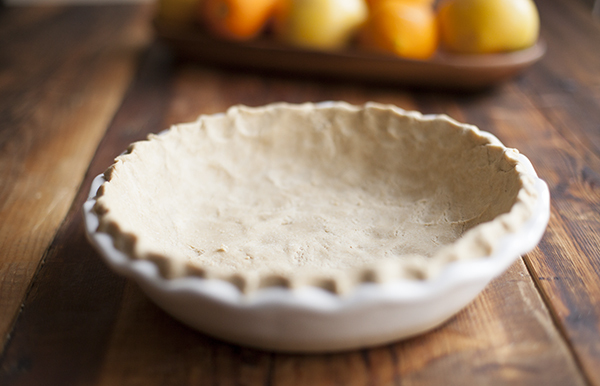 Crust can be made up to two days in advance. Preheat your oven to 350F. Bring a pot of salted water to boil. Add the asparagus and cook until they're crisp-tender (about two minutes). Plunge them into cool water, drain them, and set them aside. Heat the oil in a large frying pan or skillet over medium heat. Add the leeks and shallots and a pinch of salt. Cook until the leeks are turning golden, adding a few tablespoons of water if necessary to prevent sticking. Turn off the heat. Place the tofu, potato or beans, turmeric, miso, nutritional yeast, chickpea flour, lemon juice, mustard, and salt into a blender. Blend till very smooth; check for seasoning and season to taste. Transfer this blended mixture to the pan or skillet containing the leeks. Mix everything well. Add the asparagus and mix again. Transfer the filling to the prepared pie dish and pour the filling into the crust. Arrange asparagus spears on top to be pretty, if you like. Transfer the pie dish to your oven. Bake for 35 minutes, or until the top is browning lightly and the crust is slightly golden. If anything starts to brown before the filling sets, cover the pie dish with foil as it bakes. Once the quiche has cooled to room temperature, transfer it to the fridge and allow it to set for at least two hours (preferably 4-6). Cut into 6 or 8 slices and serve. Because the quiche needs a little fridge time to set and cool, it’s a perfect dish to make ahead of time for a weekend brunch. It’s fine to prepare the day before you plan to serve it, and you can rest assured that leftovers will keep for four days. And lovely leftovers they are. Perfect with a nutritious spring salad (my beluga lentil, butter lettuce, and radish salad with creamy lemon cashew dressing would be perfect!) and/or a nice bowl of soup. Enjoy it, friends. This week: another guest post from Steven. Stay tuned for it, and for a special giveaway on Friday! This sounds so good! 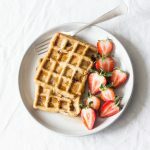 I don’t normally make particularly labour-intensive breakfasts, but this sounds well worth it! Looks great! Love how simple the crust is to make too. yumm need to try this!! This looks amazing, Gena! I have been avoiding making quiche’s since they seem “way too hard” as well, but I think you’ve convinced me with this one! I’m always up for a good challenge! This looks beautiful and amazingly delicious, wow! 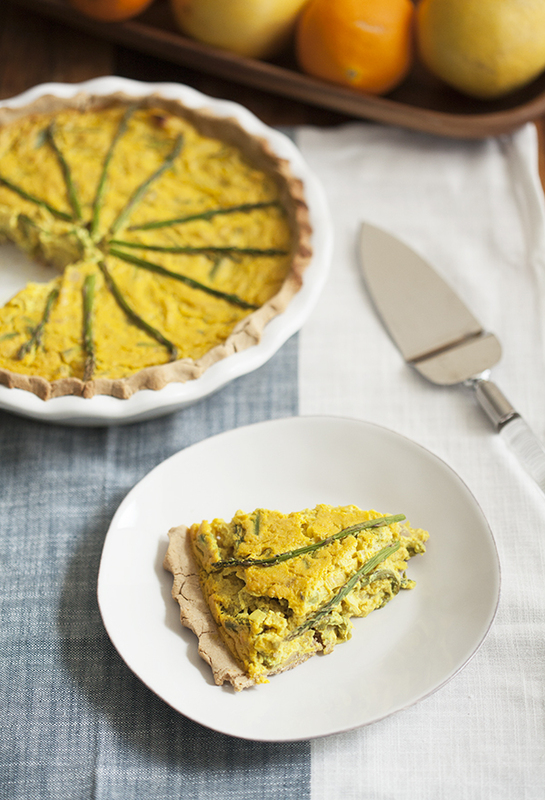 I have not attempted a vegan quiche yet and want to make this soon, thanks! The leeks in this version sound so good! Definitely need to try that! I am so intrigued! Egg free quiche!! I am in love. I’ve missed quiche so much – I can’t eat eggs. Thank you so much for sharing! 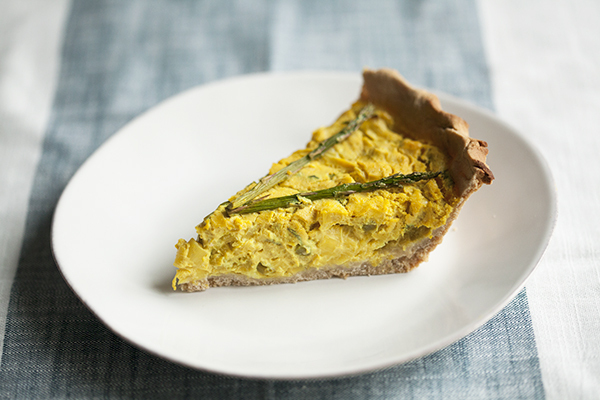 I loved quiche when I ate eggs, this looks like a great alternative! I have made it this week and it tastes really amazing ! I did not have asparagus but it turned out great anyway. It is a great basis for adding other vegetables and herbs. 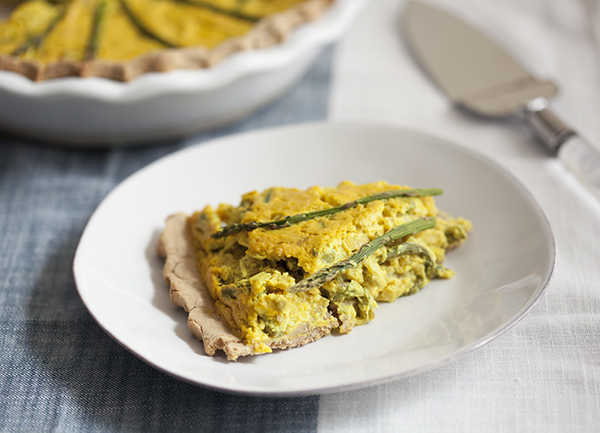 I had once tried making a vegan quiche and the recipe called for chickpea flour only, but it was really heavy. This one is much lighter and the taste is really close to non-vegan quiches ! Thank you for this recipe. My friends loved it! I made it more or less as writ, except I added celery seed and nigella seed. 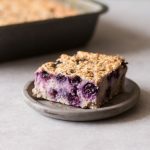 If I were to make it again, I would use a smaller pan, slightly less water in the dough and blind-bake it for a few minutes before adding the filling. Thanks for the feedback, Joanne! I appreciate your tips and am so glad your friends loved the recipe.